The new MemorialCare Neuroscience Institute at Saddleback Medical Center in Laguna Hills is opening to provide highly advanced care for conditions of the nervous system, including strokes, spine conditions, brain disorders, tumors, balance and related conditions—making it the region's newest premier institute for neurological diseases. Pictured:Among leaders of the new MemorialCare Neuroscience Institute at Saddleback Medical Center shown here in the new Hybrid Surgical Suite include (from left) Jason Liauw, M.D., Neuroscience Institute Medical Director, Neurosurgeon and Spine Surgeon; Bryce Johnson, M.D., Medical Director, Saddleback Medical Center Spine Health and Spine Surgeon; and Farzad Massoudi, M.D., Saddleback Medical Center Neurosurgeon. 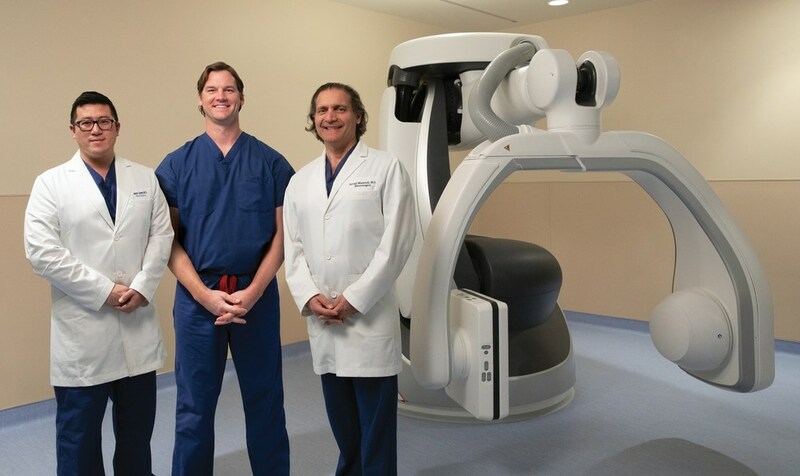 Leaders not pictured are Radoslav Raychev, M.D., Medical Director, Saddleback Medical Center Stroke and Neurointerventional Program; and Chiedozie Nwagwu, M.D., Saddleback Medical Center Neurosurgeon.